DUNKIRK, Md.—Connor Graham, one of Maryland’s top returning scholastic outfielders, announced Thursday that he has accepted a scholarship offer to attend Virginia Wesleyan College where he will play intercollegiate baseball. Graham chose Virginia Wesleyan over 26 offers from other schools in states throughout the nation, including Maryland, Virginia, Pennsylvania, New York, Indiana, California, Florida, and Ohio. He received invitations to visit and interest from over 250 baseball programs, including colleges in Canada. In the end, he visited 24 colleges before making his decision after receiving notification of Virginia’s Wesleyan’s scholarship package. Graham became the most sought-after player in Maryland AAU Baseball last year. 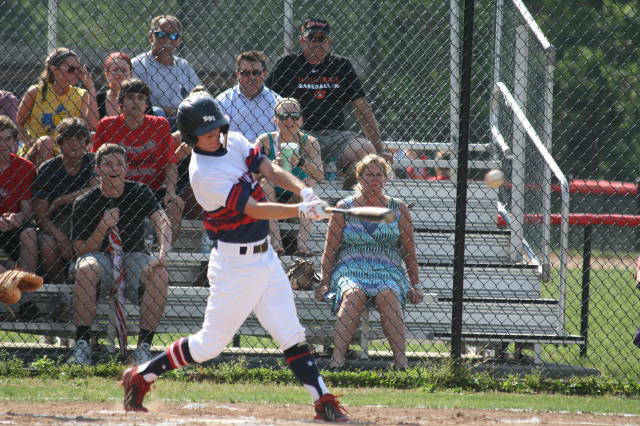 Playing 19U travel-select for Maryland RBI, the 5-10, 150-pound centerfielder received AAU Baseball’s Outstanding Youth Leadership Award for character, leadership and sportsmanship in Maryland and was voted by Maryland AAU coaches first-team Maryland AAU all-district. He finished the summer with a .426 batting average with 3 triples, 3 doubles and 17 runs batted in. He led in on base percentage (.533), slugging (.574) and on base plus slugging at 1.107. He was a member of the Planet Baseball North American team that played at the European championships in Prague and Germany. Playing for Class 3A fourth-ranked Northern as a junior, Graham was named first team all-county, a preseason all-state nominee and first team academic all-conference. It was the second time he was named academic all-conference. He hit .339 with 18 RBIs, 18 runs, and led the Patriots in doubles (5) and stolen bases (10) with a .431 OBP. Several recruiting services rate him one of the state's most-followed Class of 2016 outfielders: beRecruited’s No. 1 followed prospect overall in Maryland, FieldLevel’s No. 1 outfielder. He is among MaxPreps’s top-ranked returners in most statistical categories on the Maryland Class 3A leader board. Northern coach Bobby Gibbons praises Graham as the most recent Northern product in a big year for Patriots players reaching the pro and college ranks. The Baltimore Orioles selected Northern 2012 product Ryan Meisinger (Radford University, 2015) in the 11th round of the 2015 Major League Baseball Player Draft. Northern 2015 graduates Ryan Potts signed to play baseball at Shepherd University in West Virginia; Brandon Snow at Farmingham State University in New York; and Michael Sadler at Virginia’s Lynchburg College. CJ Cummings made the University of Mary Washington club team in Virginia. Fellow 2016 senior Bryce Rogers Black committed to Radford University. "It is with great pride that I congratulate Connor on his signing with Virginia Wesleyan,” Gibbons said. “Over the last several years, I have watched Connor develop into an outstanding baseball player and an even better young man. Hard-working and a leader, he can hit the ball well, obviously track it in the field, and he has the speed package – that's what makes him valuable to college coaches; they can see him getting on base and wreaking havoc and running down flies to the fence. That's one of the big things, having the combination of all those skills. His future on and off the baseball field is limitless and all of us involved with Northern Baseball wish him the best of luck." Connor’s dad is proud his son threw himself into the process, stuck with it and “showed every coach the utmost respect" at showcases, camps, clinics, evaluations, and college visits. Graham also had the advantage of encouragement and advice from several MLB scouts and other sources. “My family has been friends forever with Bob Desmond, a former coach in several pro organizations. He was big in AAU Baseball in the Northeast and the international game,” Graham said, “and has always had an interest in me and he’s generously shared good advice through the years. Virginia Wesleyan plays in the NCAA's Division III Old Dominion Athletic Conference, which consists of Virginia Wesleyan, Shenandoah, Bridgewater, Roanoke, Eastern Mennonite, Lynchburg, Randolph-Macon, Hampden-Sydney, Guilford, Washington & Lee, Emory & Henry. “I am beyond humbled and grateful to become a part of Virginia Wesleyan baseball,” said Graham. “To be associated with this program and what it has stood for over such a long period of time is a dream come true. I'm very excited to join the Marlins program, and look forward to the next four years of studies and getting to play college baseball against all the great ODAC competition. "It's a big deal to me that a program like Virginia Wesleyan would want me on their baseball team," Graham said. “I am very thankful to Coaches Francis and Seay and the rest of the coaches and administrators for the opportunity to be a part of it. It is a tremendous opportunity and I am very excited to do whatever I can to help the baseball program and college reach its full potential."